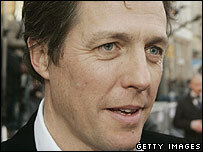 Actor Hugh Grant has been arrested over an allegation he attacked a photographer in London, before throwing a tub of food at him. Photographer Ian Whittaker told the Daily Star newspaper he was kicked before the tub was hurled at him. The Metropolitan Police confirmed a 46-year-old had been arrested on suspicion of assault and has since been released on bail. Mr Grant's lawyers confirmed an incident was now under investigation. It is thought the alleged incident took place near the actor's west London home. Mr Grant voluntarily presented himself at Notting Hill police station on Wednesday, where he was arrested and then questioned for an hour. He has been bailed and will return for questioning in a month. Mr Grant is best known for starring in romantic comedies such as Four Weddings and a Funeral, Notting Hill and About a Boy. In February, he topped the UK box office chart playing an ex-pop star in Music and Lyrics, alongside Drew Barrymore. He famously dated model Elizabeth Hurley for 13 years. He recently split from Unicef ambassador Jemima Khan.